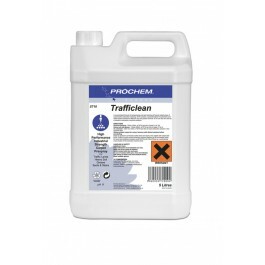 Prochem Trafficlean is an industrial strength, high concentrate formula, with extra water soluble solvents for grease removal. Use for pre-spraying and spot cleaning heavily soiled areas of carpet before extraction cleaning. Always pre-test an area for colour fastness and apply to all heavily soiled and greasy areas of carpet prior to extraction cleaning. Can also be used as a booster to extraction machine solutions. The product is a turquoise green liquid with a pleasant mint fragrance. High performance, industrial strength carpet pre-spray. For cleaning heavy soil, grease, spots and stains from traffic lanes. 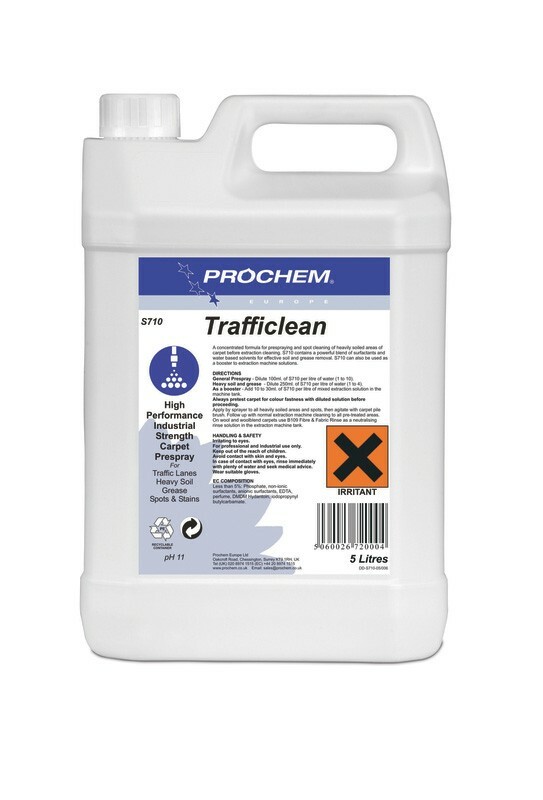 General Pre-Spray: Dilute 100ml of Trafficlean with 10 parts clean water. Heavy Soil and Grease: Dilute 250ml of Trafficlean with 4 parts water. As a booster: Add 10-30ml of Trafficlean per 1ltr of mixed extraction solution in the machine tank. Always pretest carpet for colour fastness with diluted solution before proceeding. Apply by sprayer to all heavily soiled areas and spots, then agitate with carpet pile brush. Follow up with normal extraction machine cleaning to all pre-treated areas. On wool and woolblend carpets use Prochem Fibre and Fabric Rinse as a neutralising rinse solution in the extraction machine tank.